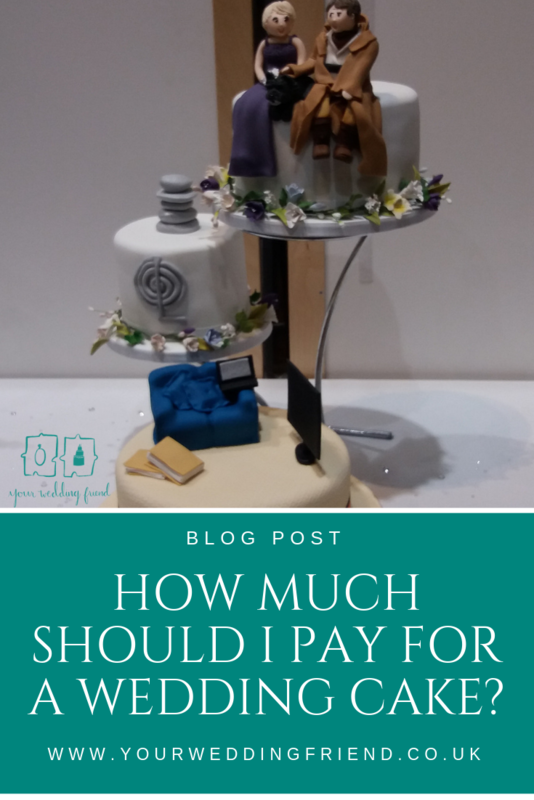 Honestly, I hear this question a lot and the real answer is how much are you prepared to pay for your wedding cake? The price of wedding cakes varies so much depending on so many elements, so I'm going to tackle some of them here. 1. How many people does it need to feed? 2. What flavour/s do we want? 3. How dramatic do we want it to be? The answer to question one will give you the minimum size of your cake; your baker can advise on what this should be, but there are suggested portion sizes on Pinterest (see my page). The second answer will give you an idea of how many tiers you might like to go for. My hubby and his family were big fruit cake fans, but I can't stand fruit cake, so I wanted to make sure I had at least one sponge tier. The answer to the third question will affect how much work will need to go into it and therefore effect the final price. A word of warning about portion size and number of guests. Many people over order on wedding cake because they assume that a single standard portion size will be too small. This isn't true. A one inch/3cm square of cake doesn't sound much but bear in mind the other food you're offering guests around this. If it's one of a selection of desserts you won't need too much cake at all but if you're offering it as the only dessert, slightly more MIGHT be required. Another thing to bear in mind with the portions is that it's not an exact science and very much depends on who is cutting your cake for you. Someone with some experience of this will know not to cut huge portions but someone else might cut larger than standard portions. There are You Tube videos on how to cut round or odd shaped cakes, just in case you need it! OK, so now you know how many people you are feeding, your baker has advised on size of tiers based on shape and depth, now you need to decide flavours. I love this part. Your baker will want to offer you a tasting session so make the most of this opportunity to try before you buy, but please if you make an appointment to try out their cakes please attend as time and effort goes into making these fresh for you and a bakers time is valuable! Now onto the complicated (or not) bit. Do you go simple naked cake, fully iced/fondanted, do you want sugar flowers or sculpted elements, etc? These all add time and effort, and therefore cost to your cake. Has the baker you like created similar styles in the past or are you asking them to experiment with new techniques? The more experienced the baker or the more technical the decoration is, the more you're likely to pay for all that expertise. It takes years of training to produce a single super realistic rose for instance. The closer you are to a simple basic lovely white cake, the cheaper it's likely to be but bear in mind a supermarket cake is cheap for a reason (cheap ingredients, preservatives, smaller than professional bakers, etc). Final thought. It's an old tradition to keep the top tier to use for the christening cake of your first child but nowadays most people don't keep any of the wedding cake, plus sponge really doesn't keep for long so it should be eaten as soon as possible. However, if you're really not cakey people then it really doesn't need to take up too much of your budget. I'm a very cakey person so I get a little disappointed when there is no cake, but if you want to replace it with a cheese tower, or cupcakes, or nothing, it's your wedding so do it your way.